You’ve been eating it wrong! I said to myself. This was my a-ha moment regarding “Umeboshi” or Japanese pickled plums. Umeboshi are a universal staple in Japan. These tiny preserved plums can be kept for years and are soft in texture yet very sour, salty yet with hints of sweetness. Its an unusual taste if you’re not prepared for it and my first time trying it years ago, I took a big a bite like I was eating, well, a regular plum. An overpowering sour taste filled my mouth. Needless to say, I wasn’t a fan. From that point on,I thought umeboshi were just another strange Japanese food to put on my “do not eat” list. Little did I know then, I would come to love these sour little plums. My change of heart happened last fall at the Hakkaisan company cafeteria. One day, I looked over and saw my colleague use his chopsticks to nip of a small piece of the pickled plum and eat that tiny salty bit on top of a bite of white rice. I tried the same and it was a revelation. Eaten in small bites together with rice, Umeboshi is absolutely delicious. I asked about the plums and was told to my surprise that they were homemade! These Umeboshi we enjoy at the cafeteria are made every year by Mr. Tanaka, one of the managing brewers at Hakkaisan. I asked Tanaka-san to show me how they were made. 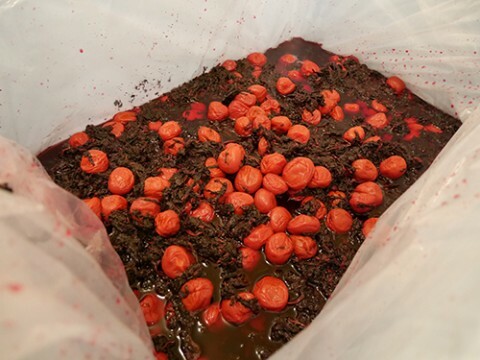 I had to wait until this summer, but I finally got my chance to see how Umeboshi come to be. I did my best to document the process below. Umeboshi of course must start with good ume. 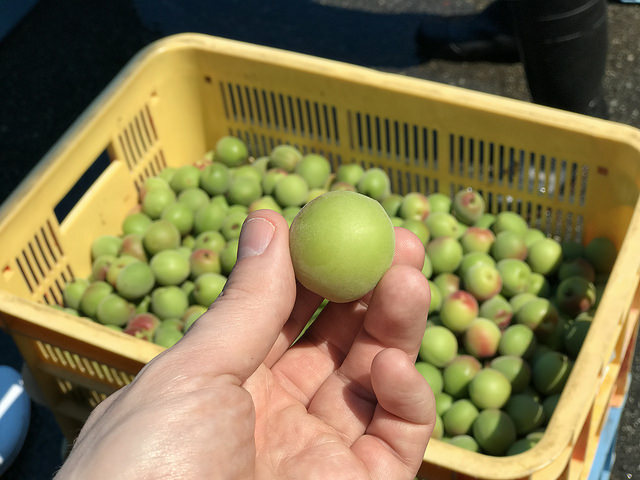 Japanese ume plums are a unique variety available widely in Japan but more rare overseas. They are quite small, about the size of a walnut and are harvested every year from mid to late June. 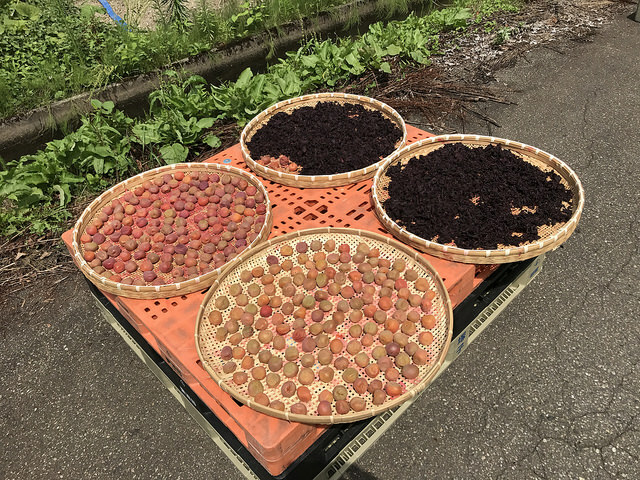 Because of that, summer is umeboshi making season. 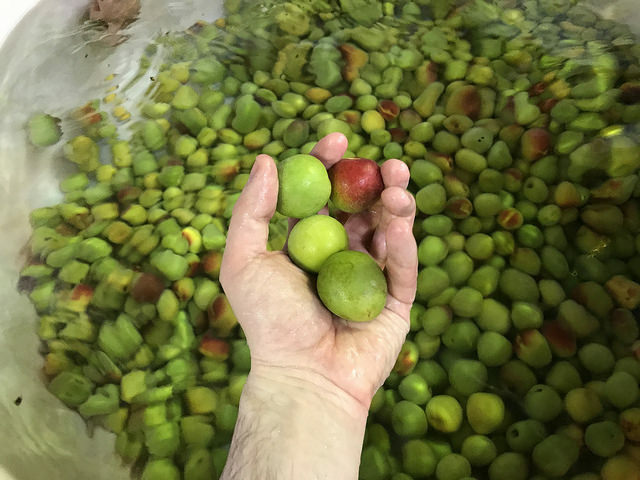 Its important that the plums be picked when they are still firm and hard and still mostly green in color. Wakayama Prefecture is the most famous ume growing area in Japan. The first step is to wash the ume carefully. 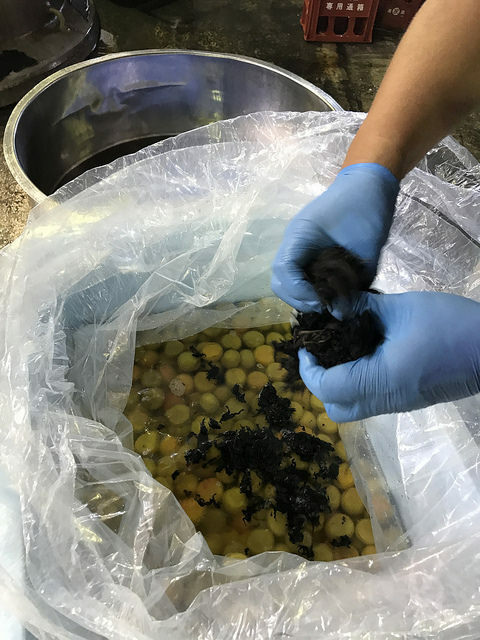 Any ume that have bruises or ripped or damaged skin cannot be used to make umeboshi. The skins must be pristine. we carefully washed each ume and then with a small wooden pick, we removed any remaining stems being very careful not to pierce the skin. If there is any blemish on the ume, mold can grow there and ruin your whole batch. 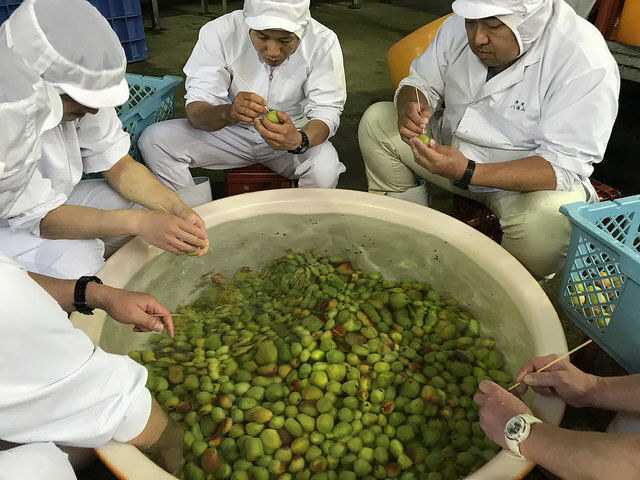 Once the ume are washed, cleaned, stemmed, and carefully checked for bleminshes the next step is to layer them with salt. Here the plums are put into a food safe container with a plastic lining. The salt will do a few things. First, the salt will draw out moisture from the Ume. 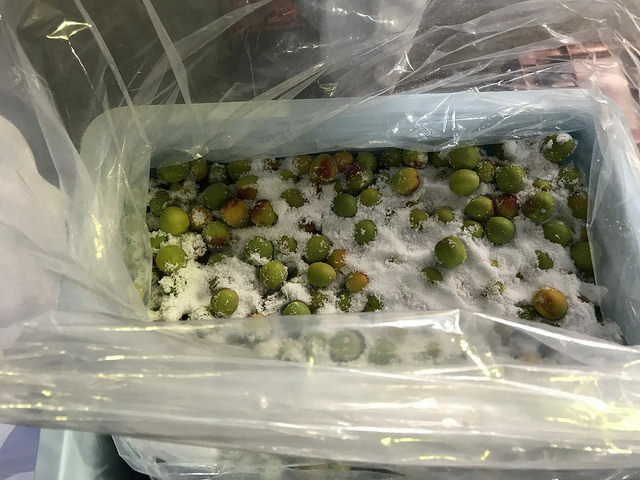 The salt content will also begin to preserve the ume and lastly, it will also inhibit the growth of any mold. Different Umeboshi recipes call for a different amounts of salt to ume ratio. Next the ume and salt mixture is sealed up with a weight on top. The weight is important to apply pressure that will help the salt to draw moisture out of the plums. Once the weight is on top, the container is sealed air tight to avoid contamination. After about 1 week, we carefully reopen the container. 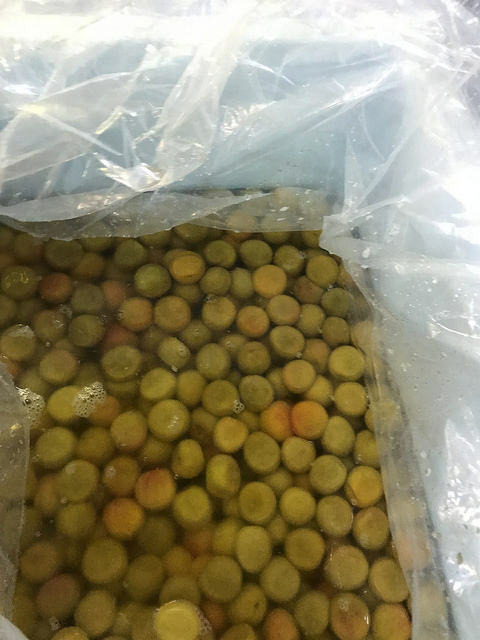 Here you can see the umeboshi are still greenish yellow in color, but now floating in liquid drawn out of the plums by the salt. If you’ve eaten umeboshi before, you know they are most often reddish in color. where does this red come from? Well, it comes from our next ingredient: red shiso. You may be familiar with green shisho leaves served along with your sushi or sashimi. Red shiso is a relative of the green variety, but quite different in taste. As such, it is not eaten raw as much. Here is the red shiso as we receive it from the farmer. I have even seen red shiso growing wild out here in the Niigata countryside. 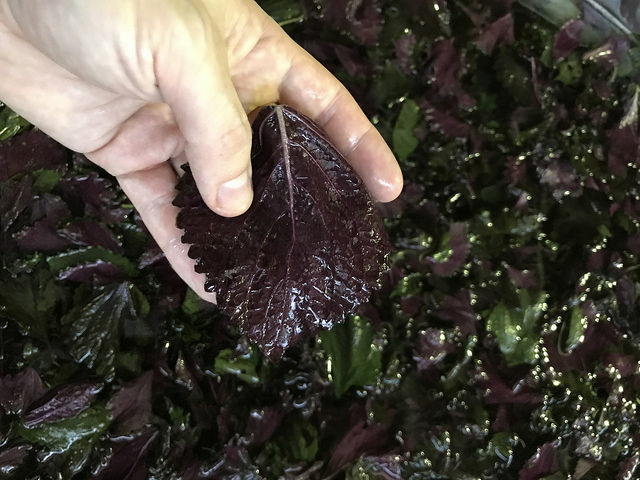 Red Shiso has a two tone leaf with a dark green top and a deep purple underside. 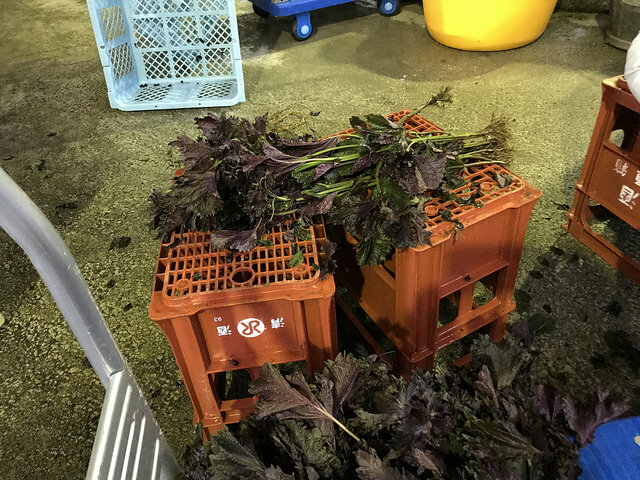 To prepare the shiso for use, we must first remove all the leaves from the stems and wash them very thoroughly. After washing, we process the leaves in big bunches. We mix them with salt and press them between our hands, squeezing as hard as possible. Tenderizes the tough shiso and removes unwanted moisture as well. 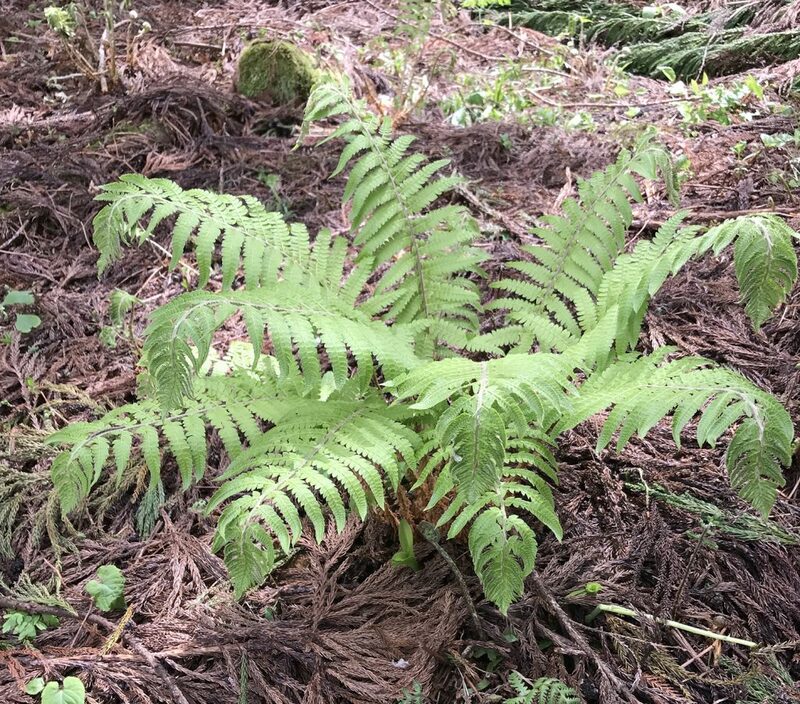 Slowly, the leaves soften up and get tender. We press them into ball shapes abou the size of a softball. 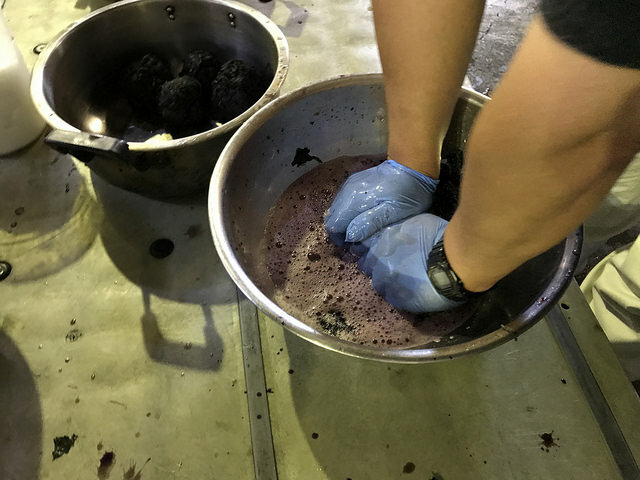 When all the shisho leaves have been washed, salted and pressed, we spread them out in one thick layer on top of all the ume and ume liquid. The weight is set back on top and the container is again re-sealed air tight. These shiso leaves will give off a coloring to the ume and the liquid, turning them from yellow-green to a reddish color. 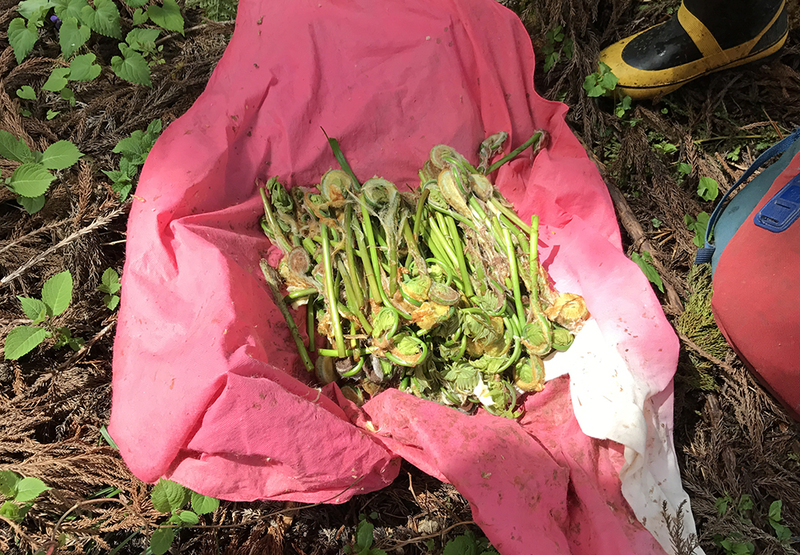 The Shisho and ume stay wrapped up for about one month. We next look to the weather forecast and try to find three days with warm temperatures and no rain. Buy this point it is early august and the rainy season in Japan is more or less over. To start the drying process, we strain all of the plums and strands of shiso from the liquid. The brining liquid is now a dark purple and we reserve this liquid. The ume and shiso are separated and carefully laid out on bamboo baskets to air dry outside in the sun. 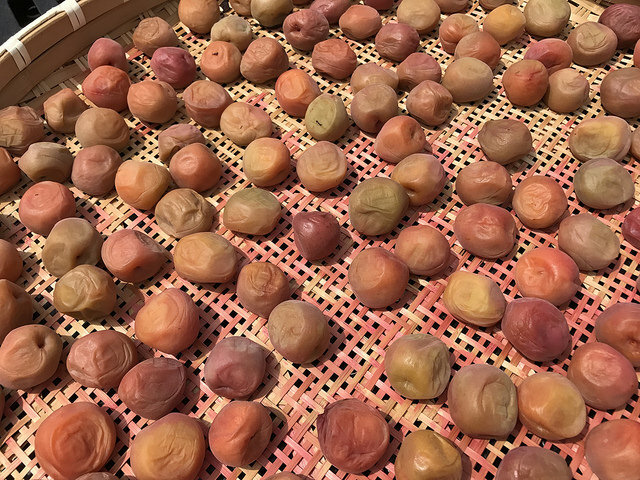 For three days the Ume are dried and turned by hand every few hours. this ensures that the plums dry evenly. Sometimes the ume skin will stick to the basket and rip. if this happens, we put these ume to the side to eat immedately, they cannot be further preserved with torn skin. After 3 days of drying in the sun, the ume and shiso are returned to the liquid to soften further and turn an even deeper red. 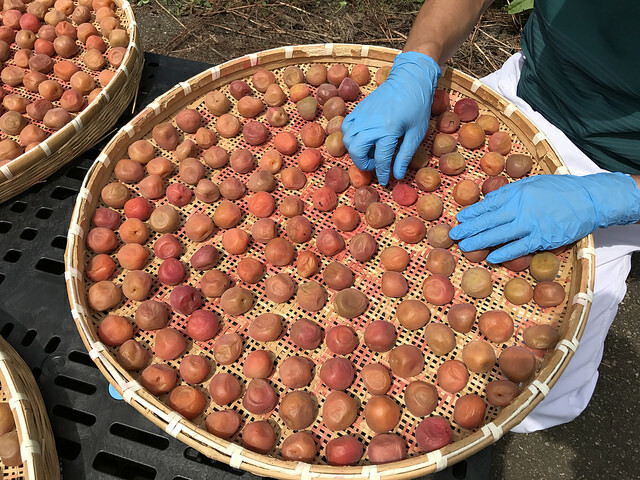 From this point on the ume are officially “umeboshi”, but further aging gives them a deeper flavor. As I mentioned above umeboshi are best eaten in small nibbles with white rice. A paste can also be made from Umeboshi and is served alongside everything from chicken skewers to cucumber. The Umeboshi is a classic japanese food. If you haven’t tried it yet, please do. Homemade is best and don’t be like me… please learn to eat it the right way! 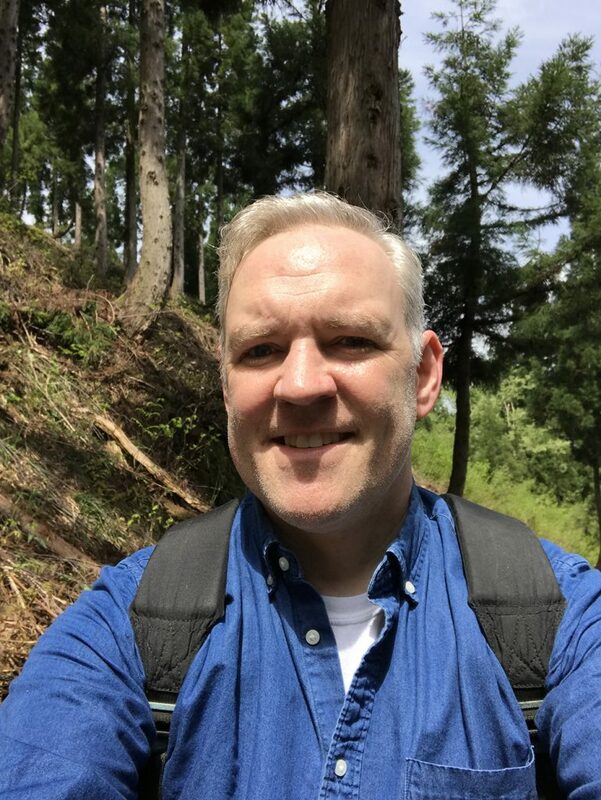 This entry was posted in Tim's Corner on October 3, 2017 by hakkaisan. If you think about making sake, where does the process really start? If you want to go to the very beginning, you need to look at growing sake rice. 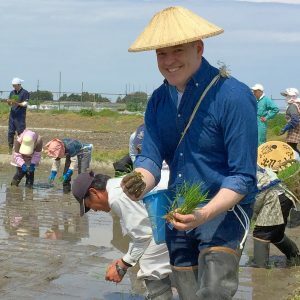 I recently had an opportunity to visit a Niigata rice farm and try my own hand at planting sake rice. 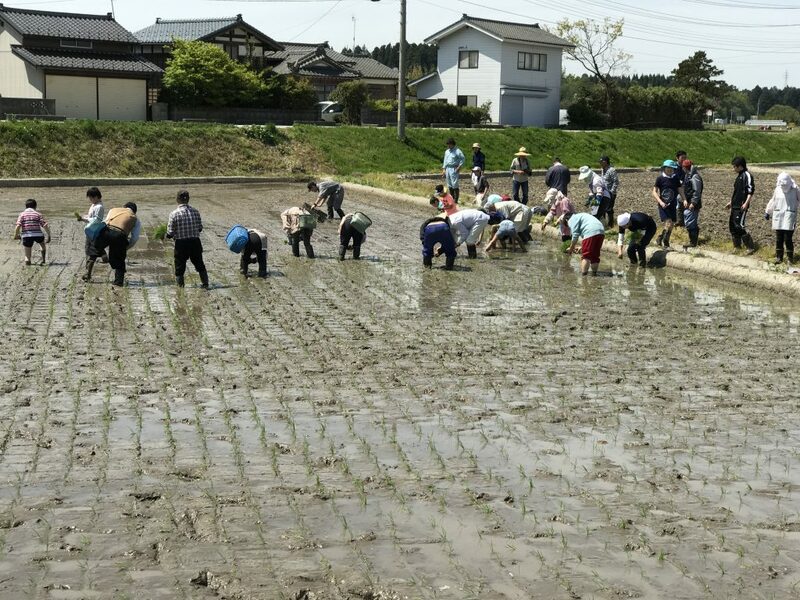 I was invited to an event known as Taue (田植え) aka “rice planting”. 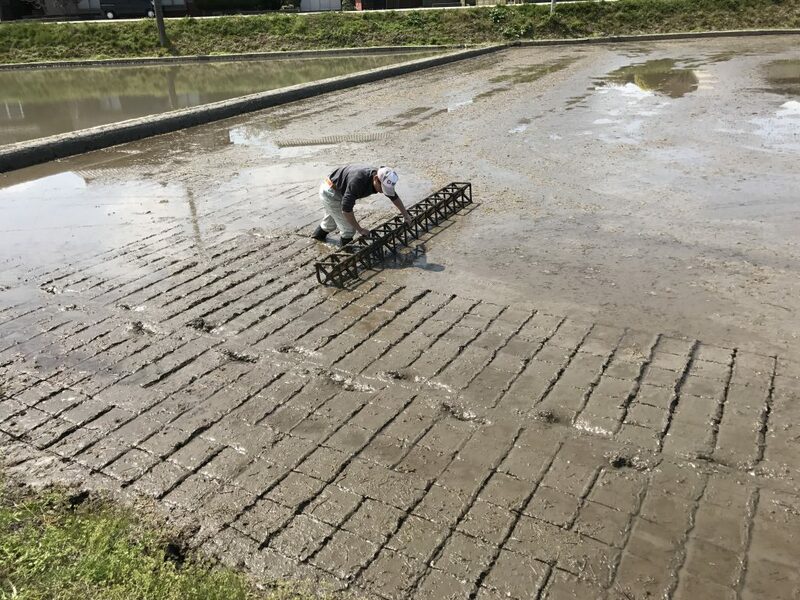 This is mostly done by mechanized tractor these days, but I was going to try planting rice by hand the old fashioned way at a local Niigata Taue community event. Kids, parents, office workers, veteran farmers and one displaced New Yorker would plant the whole field. If I was going to fall on my behind in the mud, there would be lots of people to see. 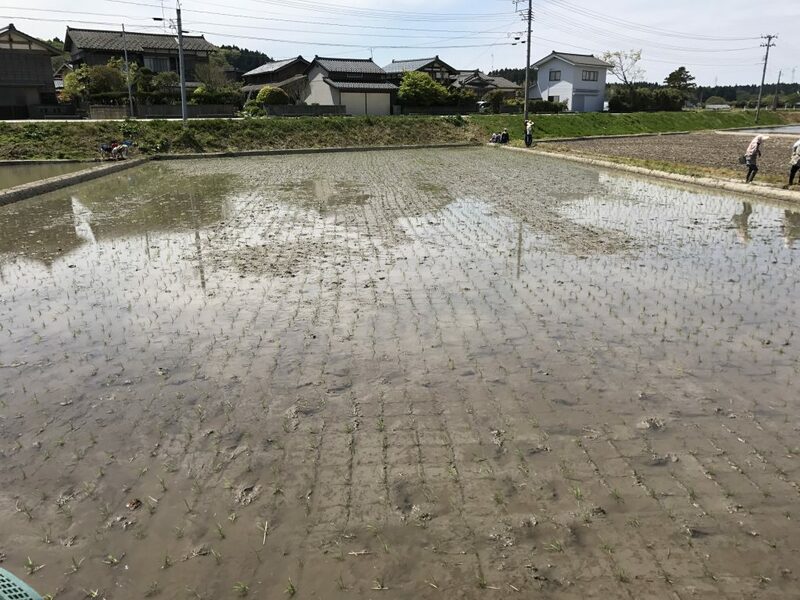 Sake rice does not start as a seed in the rice paddy. Rice is first grown from seed to seedling in trays filled with growth medium inside of a hothouse. This allow farmers to water and feed the seedlings and protects the tiny rice plants until they are big enough to be planted in the paddy. 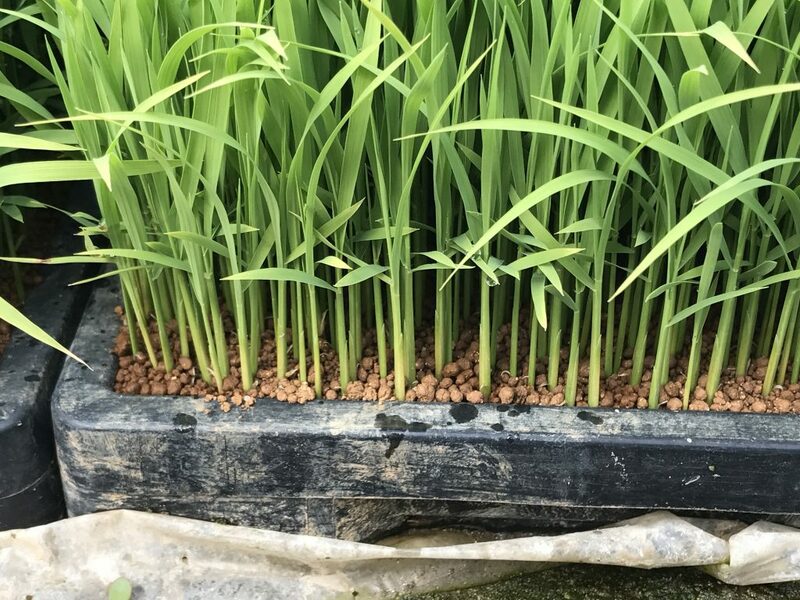 Rice seedlings ready for planting! Inside the rice seedling Hothouse. row upon row of rice plants growing in trays. These seedlings will be planted in the next day or two. Hip waders and rice paddy hat complete the look. Now that we had the seedlings ready to go, it was time to get suited up. 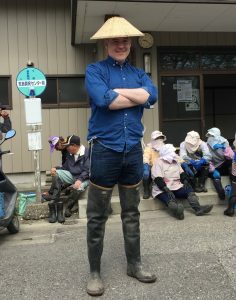 I forgot to bring my rice planting rubber boots from New York, so I borrowed a pair. The boots closest to my size were thigh-high hip waders that tied onto my belt with some string. I was also issued a pointed rice paddy hat, towel for my neck and a plastic bucket to wear like a satchel to hold my rice seedlings. The local professionals who came to help came dressed and were completely covered from head to toe. I thought this was a little extreme but then I learned the hard way that the water in the paddy acts like a mirror and will reflect the sun to give you a light sunburn from two directions! Before we started planting, the paddy needed to be prepared. To give us a guideline for planting, the farmers roll a wooden template across the mud to create a grid pattern. this is rolled back and forth down the entire length of the paddy. 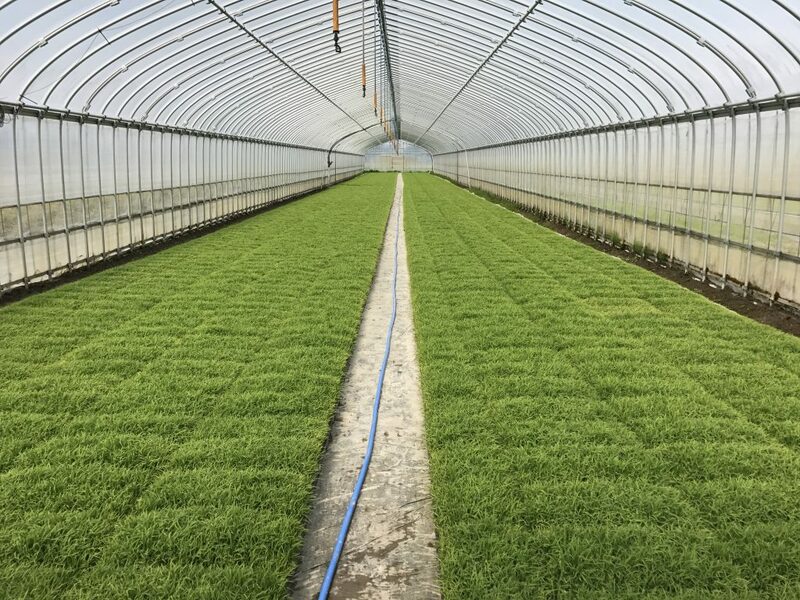 This grid allows us to plant our seedlings in the corner of each grid square and keep everything aligned and spaced perfectly. Ingenious! Rolling the wooden template across the paddy to create a grid that will guide us in planting the rice seedlings. Into the mud! Ready to plant. I was given some instructions on how to plant. First, grab a chunk of rice seedlings in your left hand. Then using your right hand, break off a little bundle of 3 seedlings. Stick the seedlings into the mud at the corner of the grid. Repeat and repeat! I quickly learned that only using your right hand to plant is a good idea is it quickly becomes covered in mud. After a few rows I was feeling confident and I ventured further into the paddy. Then I began to sink. Soon the mud was up by my knees and it was hard to walk or move forward. Trying to pull one leg out of the mud to step forward threw me off balance and made me wobble, but luckily, I didn’t fall in front of 50 people. I planted all the rice I had in my basket, 3 stalks at a time until it was empty. Then I found myself stranded in the middle of the paddy with a long walk back to the edge. Walking slow and stilted like Frankenstein, I slowly made it back to safety! The first thing I did was squat down to rinse my hands in some running water. The mud on the back of my thigh high boots managed to get on my behind that way, so even though I didn’t fall, I still wound up looking like I did. Everyone working together to plant the whole field! With everyone helping, the field was planted in about an hour. I thought it would take three times as long. After the planting was done, the rice field is flooded with water. 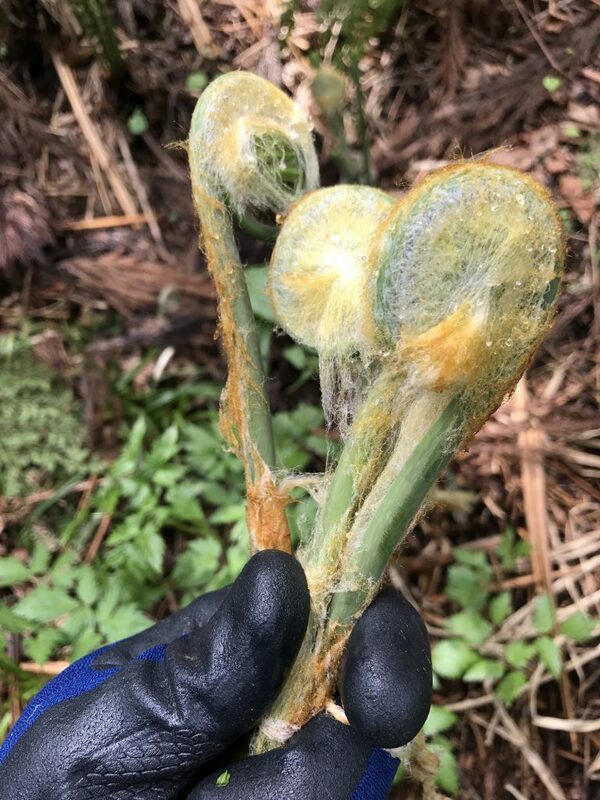 This keeps the seedlings protected and inhibits the growth of weeds. Looking out at the finished paddy, I couldn’t help feel a sense of accomplishment, even though I only planted a small part. The lines of rice were not as laser straight as a machine could do it, but I think doing things by hand can be its own reward. The next step in my farming career? I’m heading back into the mud this September to harvest! The finished rice paddy after planting!! This entry was posted in Tim's Corner on June 3, 2017 by hakkaiedit. 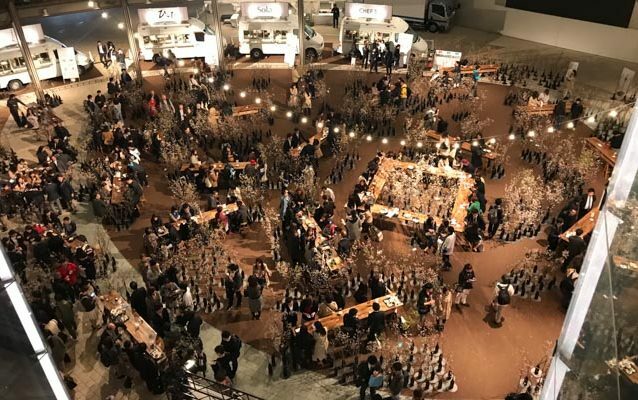 I’ve attended a lot of sake events over the years, but few have been as fun and creatively organized as Craft Sake Week at the Roppongi Hills Arena (April 7-16). 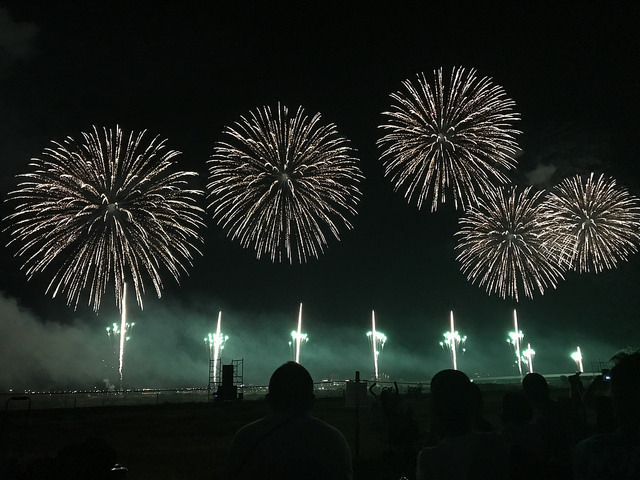 This event, spearheaded by soccer star and sake fan Hideyoshi Nakata, started last year but has come back bigger and better for 2017. Over a 10 day run, the event features a total of 100 brewers pouring their products and interacting directly with consumers. 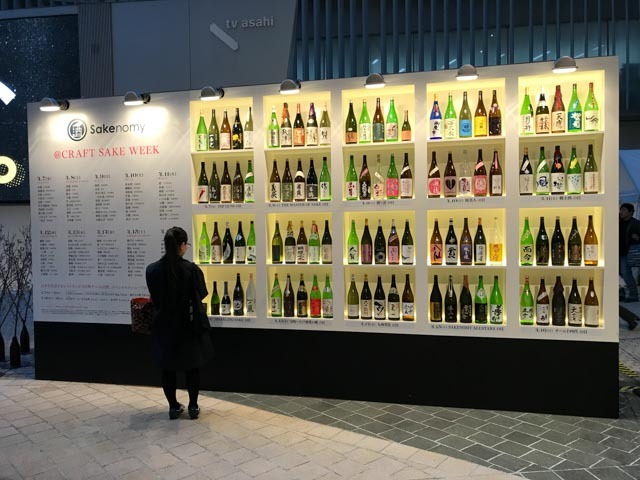 Each of the 10 days of craft sake week has a unique theme. I was pouring sake on April 12 which was “Sparkling Sake Day”. For fans of Happo-shu (sparking sake), this must have been heaven to have so many bubbles to choose from. Hakkaisan featured three sakes: Awa Junmai Ginjo Sparkling, Nigori Sparkling and the Snow-Aged Junmai Ginjo 3 Years. 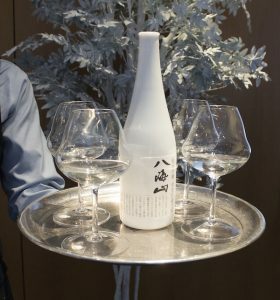 I think all of these sakes were popular, but it was especially fun to introduce guests to our new clear sparking sake, “Awa”. 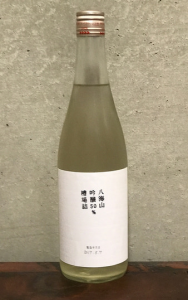 This new sake is made using an in-bottle secondary fermentation and similar to fine sparkling wines, the sake is also disgorged by hand, creating a clear sake with a fine grained bubble and gentle sweetness. 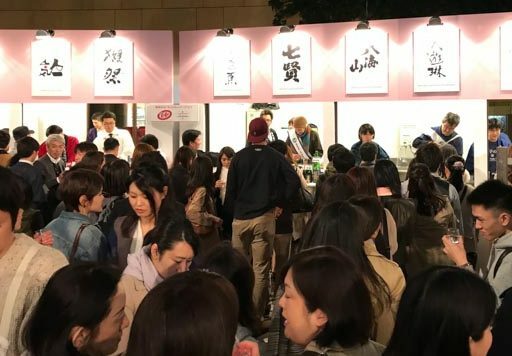 To participate in Craft Sake Week, guests purchase coins that can be used for sake or for the onsite gourmet food trucks. Sakes cost from 1 to 3 coins and guests are issued a sake glass and can wander and try sake at their own pace. 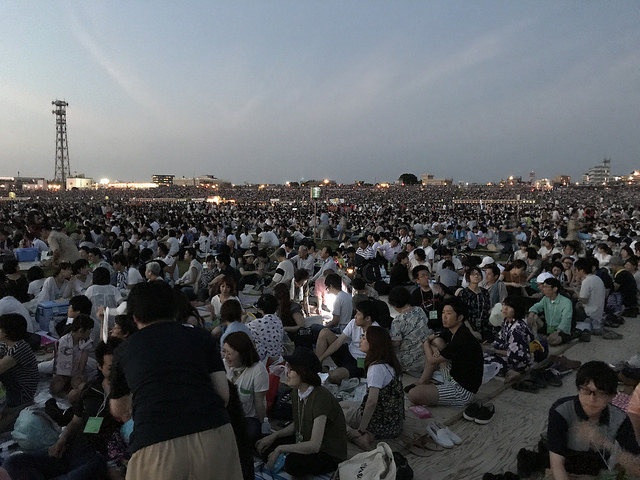 Tables and seats are spread around the open air arena and an expansive live cherry blossom installation designed by architect Sou Fujimoto adds a beautiful backdrop and creates and immersive Hanami (cherry blossom viewing) experience. It’s beautiful in the day and evening. 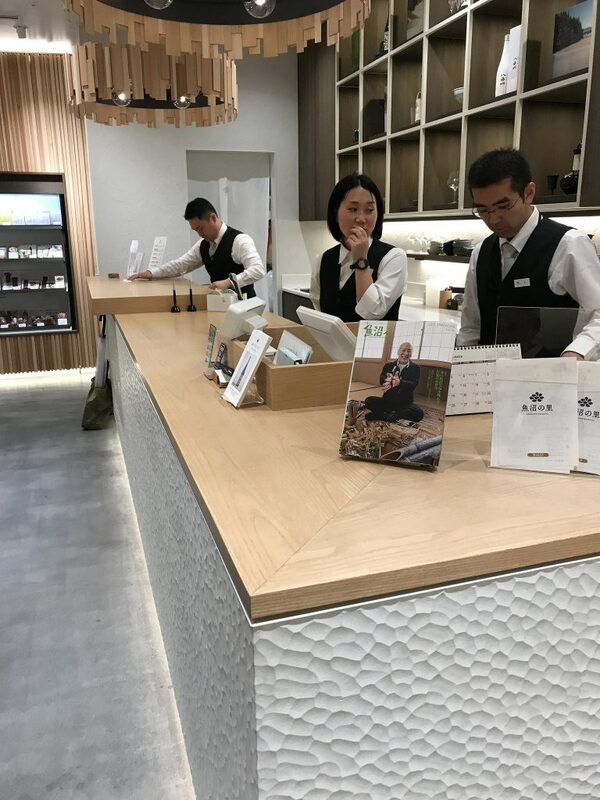 In addition to being able to talk to a variety of Brewers and to try a wide range of sakes, chatting with other sake fans is also really fun. The crowd was an international group with a lot of non-Japanese in attendance, too. 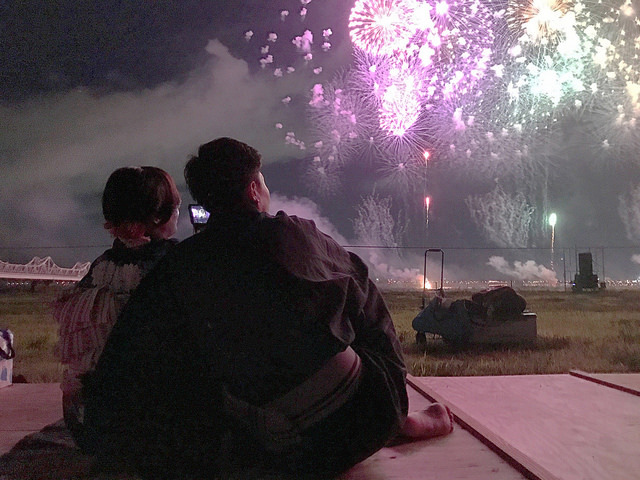 It was great to see so many people enjoying sake together. 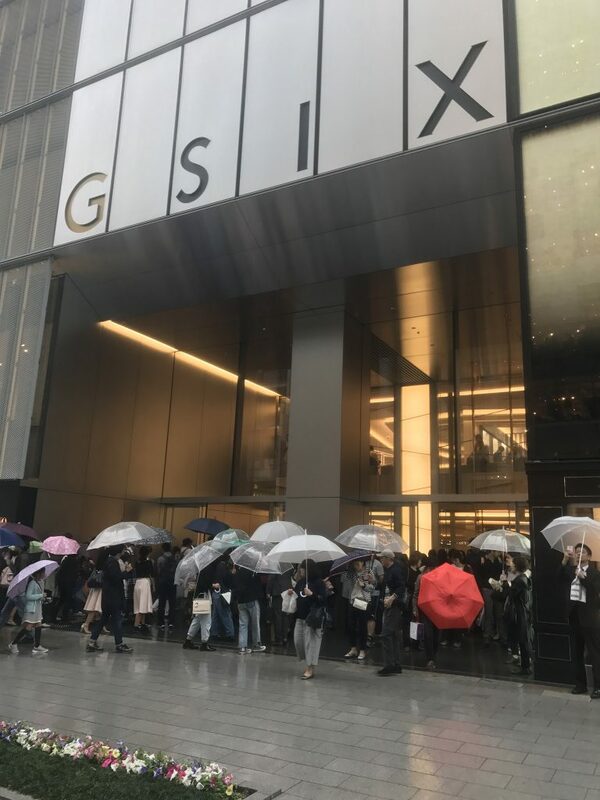 While the sake and food were amazing, there was also some other attractions such as a carnival style game to win sake flavor Kit Kats as well as sake pottery for sale. 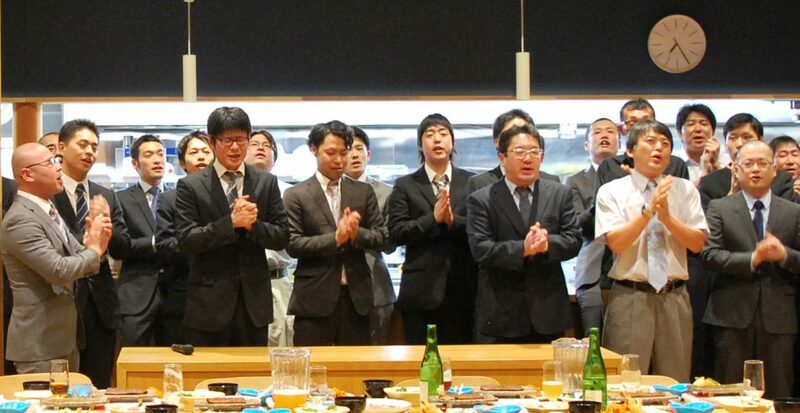 This event was exciting for me because it showed the evolution of what a sake tasting can be. It does not have to be only a restaurant pairing dinner or a formal standing sake reception in a hotel ballroom. 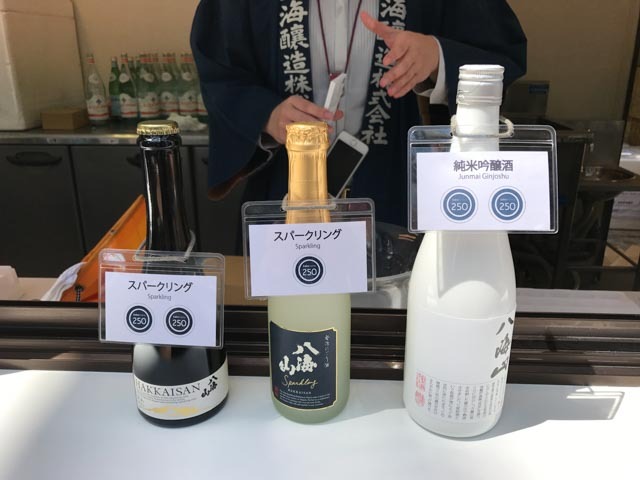 Making sake tasting fun, stylish and exciting is a great step towards creating new sake fans and growing our industry. And as for me, I’m already excited to see what the folks at Craft Sake Week will cook up for next year! Kanpai! This entry was posted in Tim's Corner on May 15, 2017 by hakkaiedit. 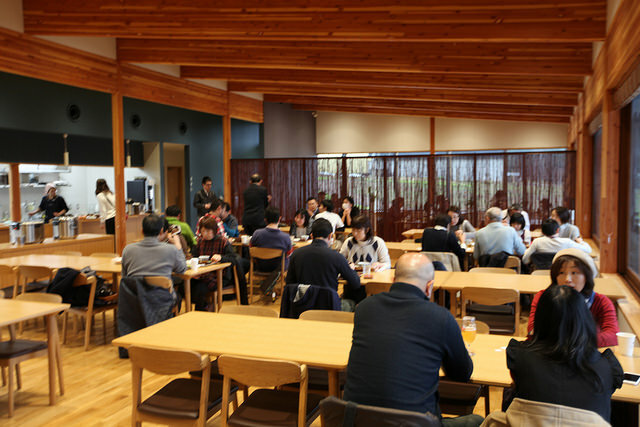 Hakkaisan Company Cafeteria. Minna no Shain Shokudo. One of the perks of living in Niigata Japan has been the food… the glorious food! After 6 months here, almost every single meal I’ve had here outside my own home has been really, really good. 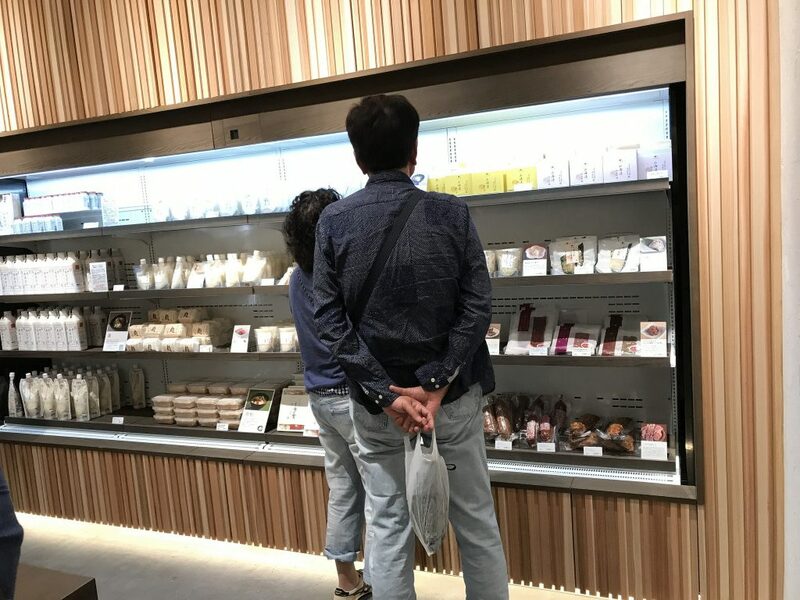 Japan values high quality food and gets it right. One of my favorite styles of food here is Japanese homestyle cooking. This way of cooking is rustic with limited ingredients and is usually very balanced and healthy. The best place I have found to enjoy Japanese homestyle cooking is the Hakkaisan Company Cafeteria. This building is called Minna no Shain Shokudo or “Employee Cafeteria for All”. This cafeteria is “for all” because it is open to employees and guests or visitors from outside the company, too. Anybody can stop by for lunch! Employees can order breakfast, lunch or dinner any day. For visitors, the cafeteria is open to the public for lunch every day from 11am – 3pm. Most often, you can find me at Minna no Shain Shokudo for lunch. Typical Employee Lunch Tray at Minna no Shain Shokudo. Ham Katsu, Shredded Cabbage, Potato Salad, Koshihikari rice and Miso soup. I sat down with Cafeteria Manager and Head Chef Mr. Sano to discuss the ins and outs of running a busy company cafeteria. Sano-san is tasked with a big challenge – for hungry brewers, he has to provide 3 meals a day, every day of the year (except New Years). 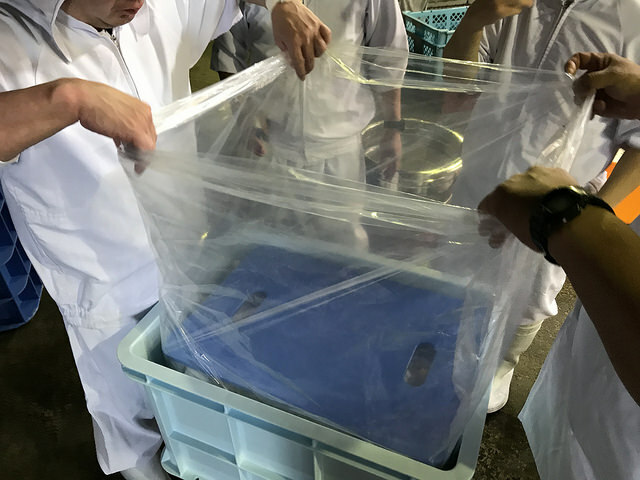 During the brewing season, the sake mash does not take a rest, and neither do the brewers, so meals must be provided on weekends and holidays too. Every day sees as many 90 employees enjoy their breakfast, lunch or dinner at the cafeteria. Employees are served a simple buffet style meal that changes every day. Two constants every day are miso soup (with amazing in-house homemade miso) and delicious koshihikari rice (a prized local specialty). 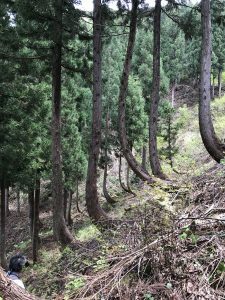 A word about Koshihikari rice – It is some of the best eating rice you’ll find anywhere and it grows all around this region. We are lucky to get to enjoy it every day with our meals. Please try it if you get the chance! 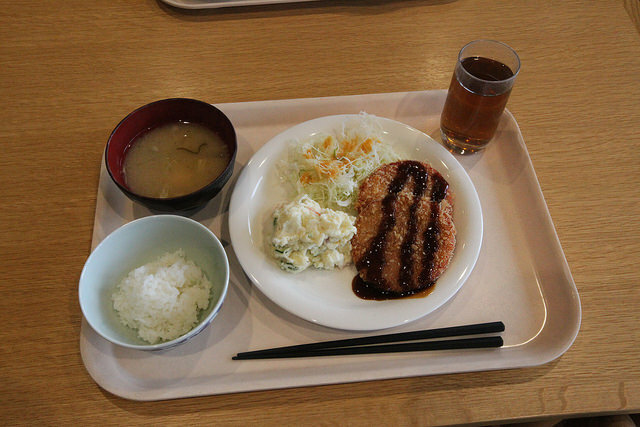 An example of the lunch set for guests visiting the Hakkaisan Company Cafeteria. 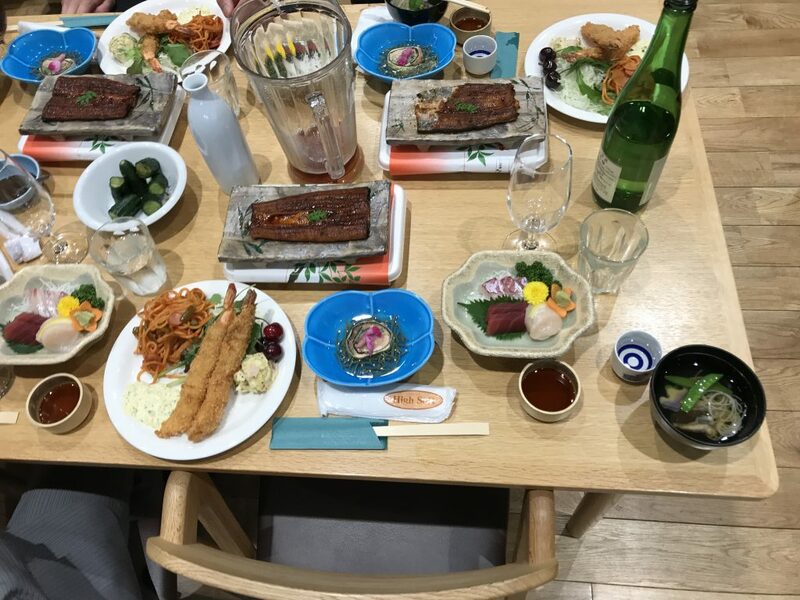 Guests visiting the Hakkaisan Company Cafeteria don’t eat the same lunch as the employees, but rather they enjoy a delicious set menu with a choice of meat or fish. This set for guests also includes the homemade miso soup and koshihikari rice. There are always a few seasonal sides along with salad and delicious homemade pickles, too. It is a fantastic home cooked lunch that draws people from far and wide. I see a lot of locals during the week and visitors from far and wide on the weekends. In the winter, I have also seen guests in their skiing gear grabbing lunch after a morning on the nearby slopes! 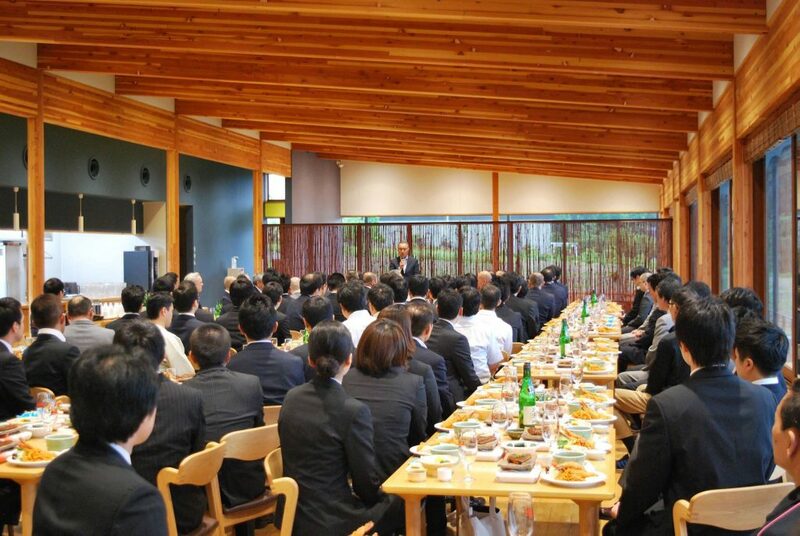 If you visit us during lunchtime, you can enjoy lunch in the same room with the sake brewers! Please say hello! So what’s on the menu for the brewers? 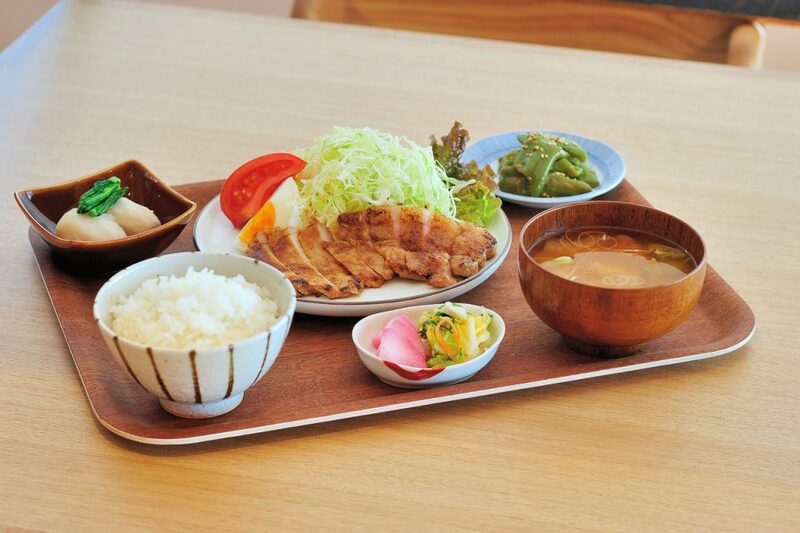 Sample menus for employees include pork katsu with heaping sides of shredded cabbage and delicious salads on the side. Udon with homemade Tempura. Curry over rice with a side salad. And the employee’s favorite lunch? Sano-san tells me that is without a question karaage fried chicken tenderized with shiokoji, a salt and koji rice mixture. The karaage IS delicious but I’m team pork katsu when it comes to my favorite lunch. 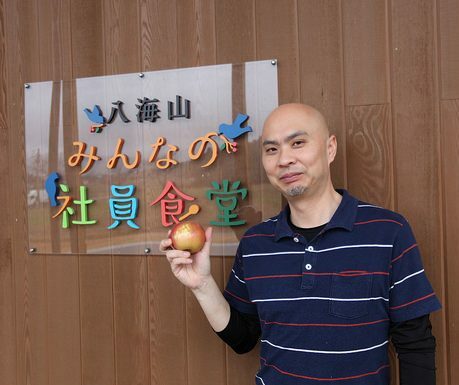 Minna no Shain Shokudo Head Chef Mr. Sano. You may be surprised to learn that there are some foods that are strictly off the menu at sake breweries. First is natto. For those who don’t know, natto is fermented soybeans with a slimey texture and strong smell that is much beloved by most Japanese. 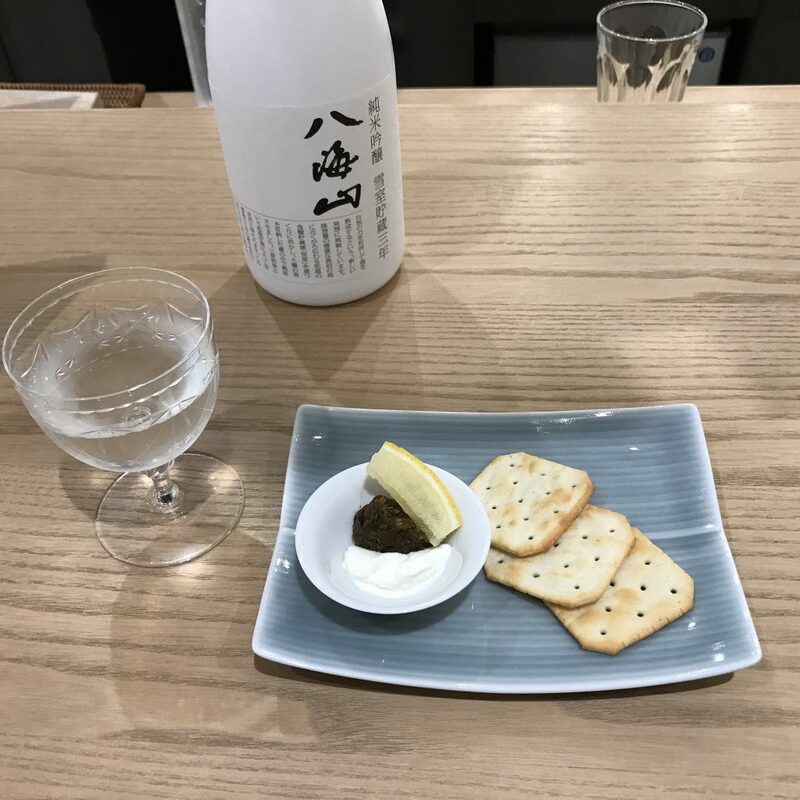 For sake brewers, eating this is forbidden as the microbes that ferment natto are powerful and could potentially interfere with the microbes of sake fermentation. Because of the strong odors, garlic is also avoided. Finally, Japanese mikan (kind of like a small orange) is also not allowed. The orange oil that is found in the mikan peel can get on your hands when peeling the mikan and it has antimicrobial properties which can inhibit fermentation. Staying away from natto, garlic and mikan luckily leaves lots of leeway to have a great collection of dishes. 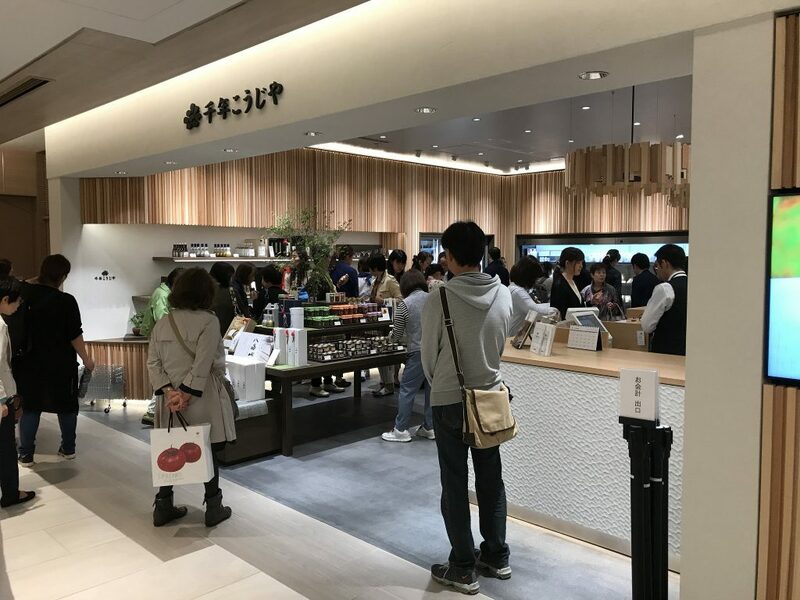 If you are in Japan, a visit to the Hakkaisan Cafeteria is a wonderful way to spend a leisurely lunch – You’ll become a fan of Japanese homestyle cooking, too! 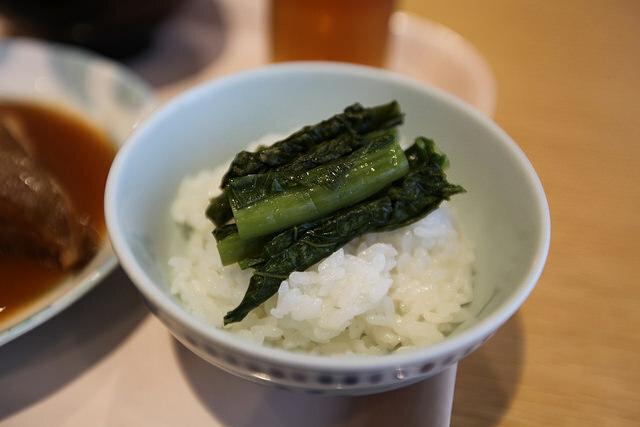 Koshihikari rice, a prized local specialty with local mountain vegetable Pickles! This entry was posted in Tim's Corner on April 21, 2017 by hakkaiedit. Some sakes are at their best when they are fresh and young. Most sakes taste best when they are stored for just a few months. And a rare few sakes really come to life when aged under special care for several years. I recently had the opportunity to taste just such an aged sake… a new product called “Hakkaisan Snow-Aged Junmai Ginjo 3 Years”. Aging sake can be a tricky business. 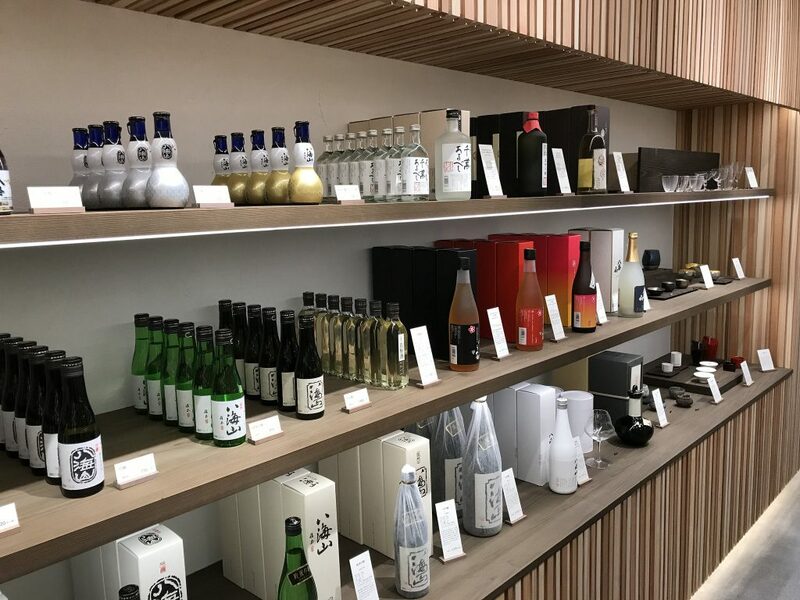 If not done skillfully, sake can turn stale and bitter tasting with age. If done well, aging sake can concentrate flavors and enrich and deepen the best traits of a sake. 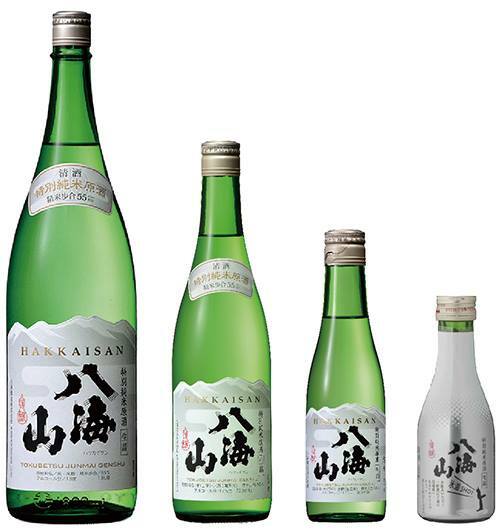 Hakkaisan uses two ways to achieve richness and balance in their aged sake. 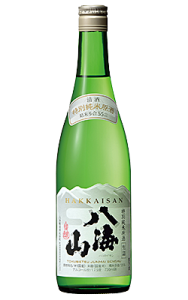 First, Hakkaisan makes use of an abundant, local natural resource in aging their sake: snow! 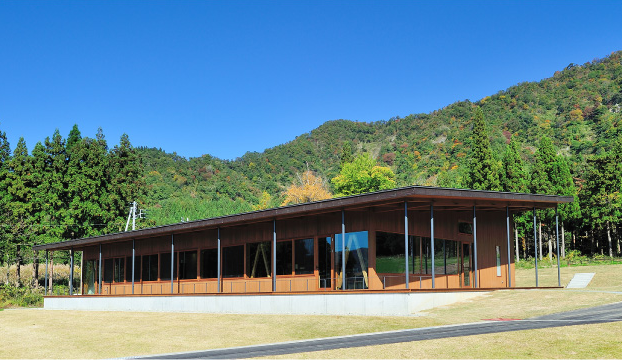 Hakkaisan Brewery is located in Minami Uonuma City, an area of Japan famous for heavy, deep snowfall in the winter months. 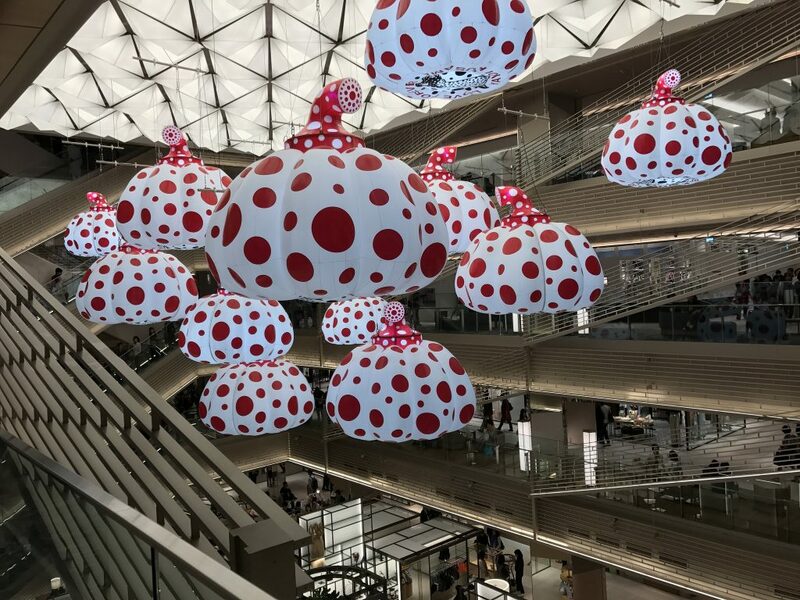 Hakkaisan has harnessed the power of the snow by creating what is known as a “yuki muro” or snow storehouse. The Hakkaisan Yuki Muro is a large insulated room that contains a 1000 ton pile of snow placed next to 20 sake storage tanks. The sake is chilled in tank using the cold from the snow alone. No electricity at all is used for chilling the sake making this a very eco-friendly facility. 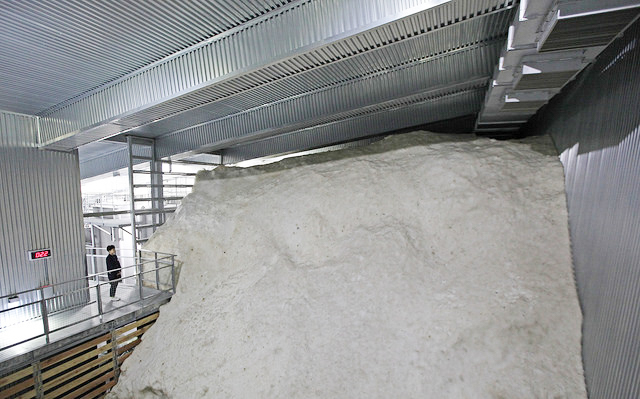 Inside the Yuki Muro Snow Storehouse. 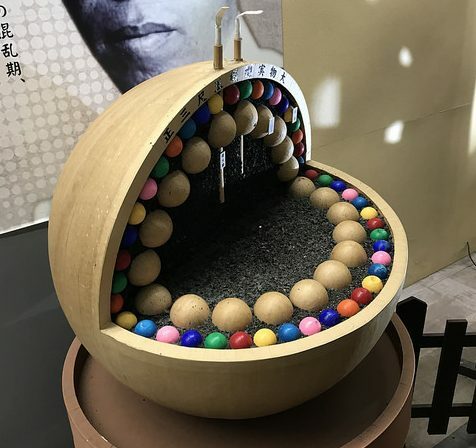 This snow storage concept is not a new one and has been used for generations in snowy regions in Japan to refrigerate foods before electricity. The snow in Hakkaisan’s Yuki Muro never melts completely, even after a full year, and it is re-filled with fresh snow every February or March. The temperature is a steady 2-5°C (37-41°F) throughout the year – an important point as too much temperature variation can adversely impact sake as it ages. Being able to chill sake at a steady temperature without electricity has another advantage. 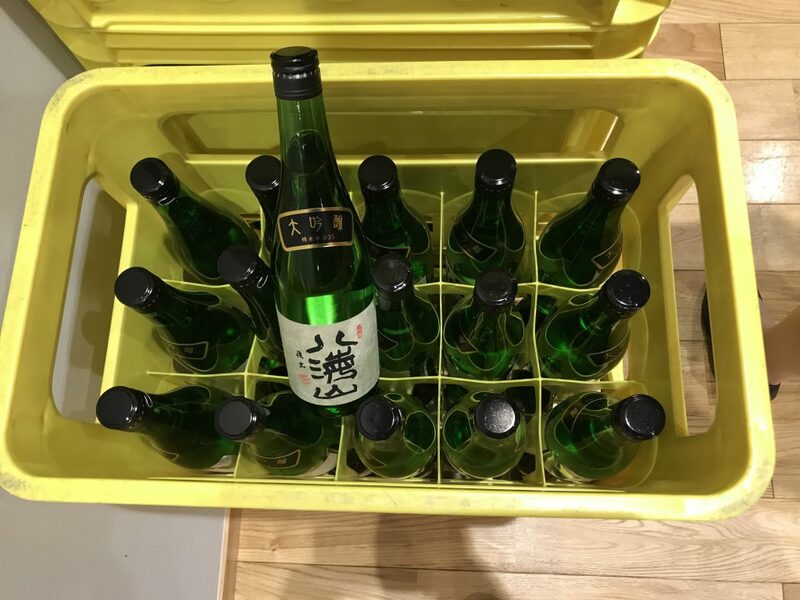 In the case of power outage or natural disaster, the sake will continue to age properly with no impact to the temperature. The other method used to create depth of flavor and richness is aging and bottling this sake as a genshu. 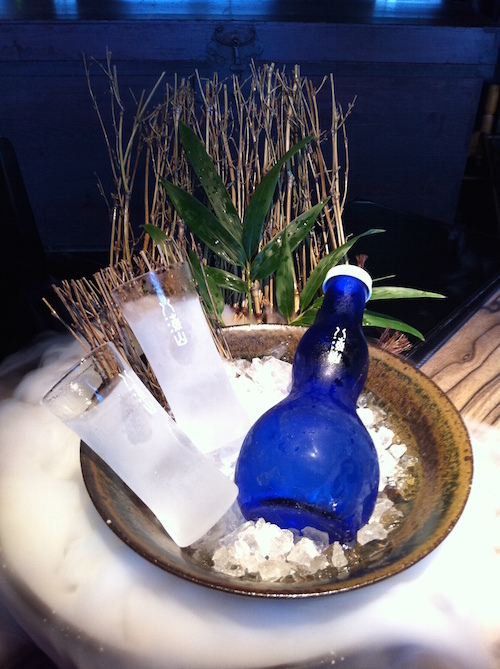 Most sake is diluted with water after production to bring the alcohol percentage usually down to about 15.5%. By contrast, genshu is a style of sake that is undiluted with water, similar in concept to “cask strength” products in the world of whiskey. In the case of Hakkaisan Snow-Aged Junmai Ginjo 3 Years, the alcohol percentage is 17%. What are the advantages of genshu? 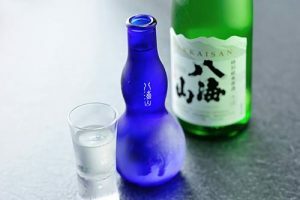 As genshu sakes are higher in alcohol, they offer more body, weight and structure to the sake. This translates into the ability to pair genshu sakes with non traditional foods. The keyword here is Umami! Richer foods with lots of savory characteristics pair beautifully with this genshu sake. Pairing ideas along this vein include beef tenderloin, Mediterranean seafood and even liver paté. This genshu sake also has the heft to stand up to mildly spicy dishes as well, so please try this sake with black pepper chicken or beef curry. Let’s look at the stats for Hakkaisan Snow-Aged Junmai Ginjo 3 Years. Hakkaisan Snow-Aged sake displayed in Ice. This sake is sold as a junmai ginjo grade sake, but the milling rate is actually 50% – a super premium level of milling. Milling sake rice to this level gives sake a clean and smooth body with no hint of sharpness or harsh edge. The aroma is restrained and elegant with soft hints of rice – a hallmark of the Hakkaisan brewing style. The palate is full bodied and rich with the gentle aging process creating a rounded texture. Lovely and delicious rice notes accent the primary flavors of this sake. Despite the bold body, the finish remains crisp and cleansing – ideal for food pairing. I recommend a well chilled serving temperature to bring out the invigorating essence of this sake. 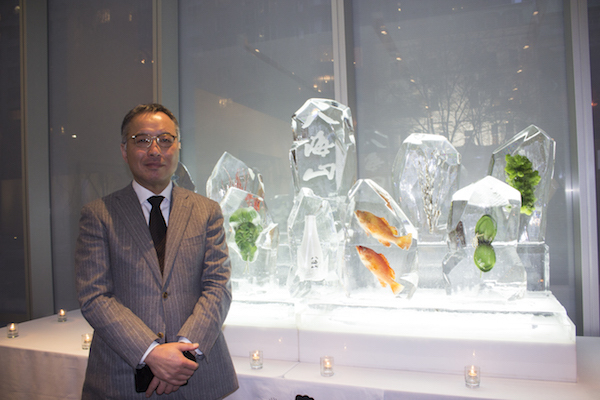 Hakkaisan Snow-Aged Junmai Ginjo 3 Years was recently introduced to the USA with a a launch party at The Modern, the Michelin starred restaurant at the Museum of Modern Art in NYC. The event was attended by about 100 guests from New York restaurants and wine shops as well as press and VIP guests. Appetizers were passed for the group to try pairing this Snow-Aged Junmai Ginjo with non-Japanese cuisine. 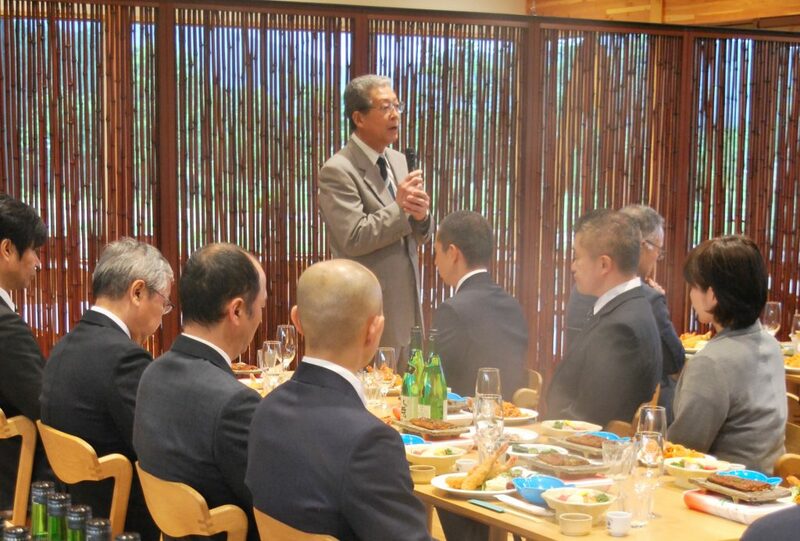 The President of Hakkaisan Brewery, Jiro Nagumo, was also on hand to introduce the sake to the attendees. 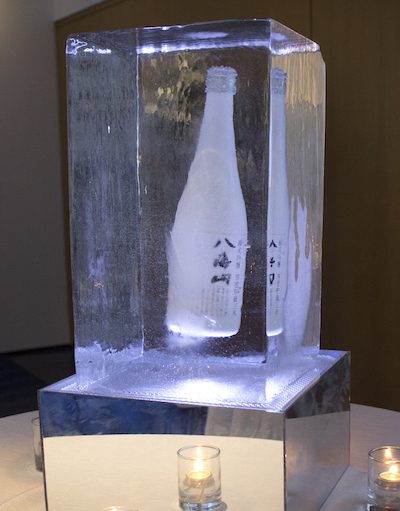 It was noted that the beautiful all white bottle design is a reflection of the roots of snow storage used for this sake. You will soon see Hakkaisan Snow-Aged Junmai Ginjo 3 Years appearing in your local sake shops and restaurants. Please try this sake that is new to the USA – you can get a taste of Japan’s Snow Country in your town! This entry was posted in Tim's Corner on April 7, 2017 by hakkaiedit.